Tera W. Hunter, Bound in Wedlock: Slave and Free Black Marriage in the Nineteenth Century. Harvard University Press, 2017. 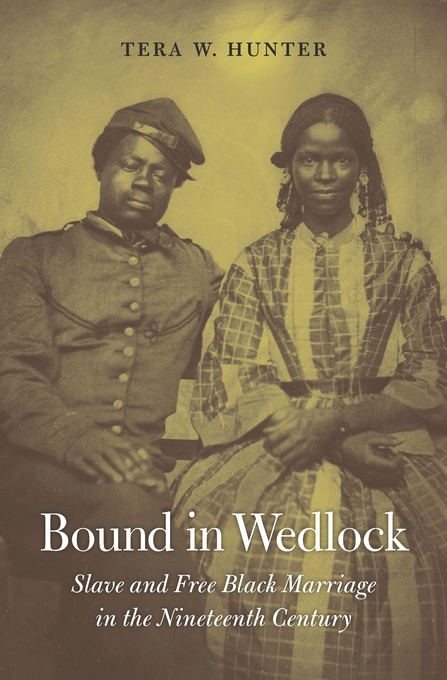 “Bound in Wedlock is the first comprehensive history of African American marriage in the nineteenth century. Uncovering the experiences of African American spouses in plantation records, legal and court documents, and pension files, Tera W. Hunter reveals the myriad ways couples adopted, adapted, revised, and rejected white Christian ideas of marriage. Setting their own standards for conjugal relationships, enslaved husbands and wives were creative and, of necessity, practical in starting and supporting families under conditions of uncertainty and cruelty.